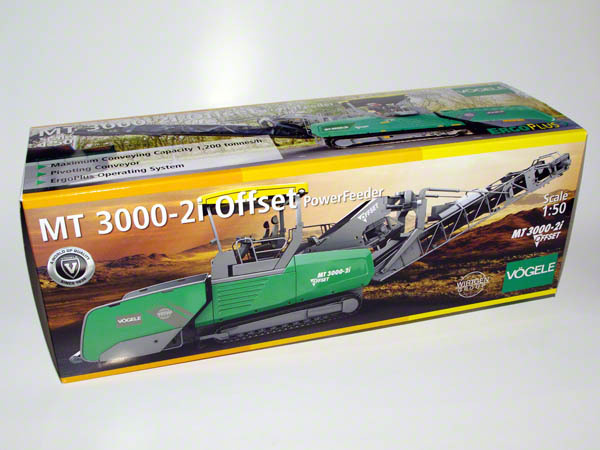 The model of the Vögele MT3000-2i Offset is made by NZG and comes in a box printed with photos of the real machine. Inside this box, the model is packed in two pieces of styrofoam. 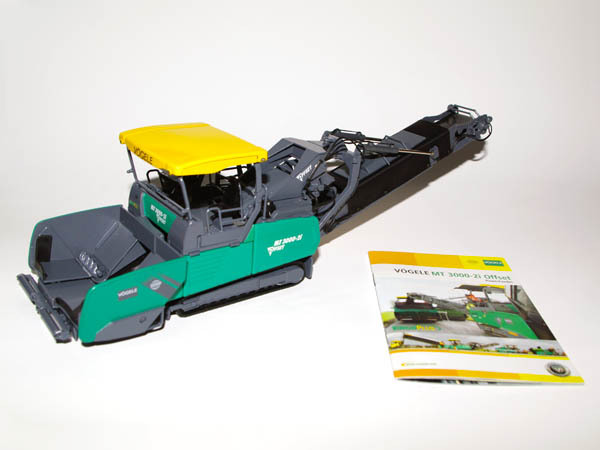 As with previous Vögele models, this model also comes with a small booklet with pictures and specifications of the machine. At first glance, the model is bigger than you would expect. 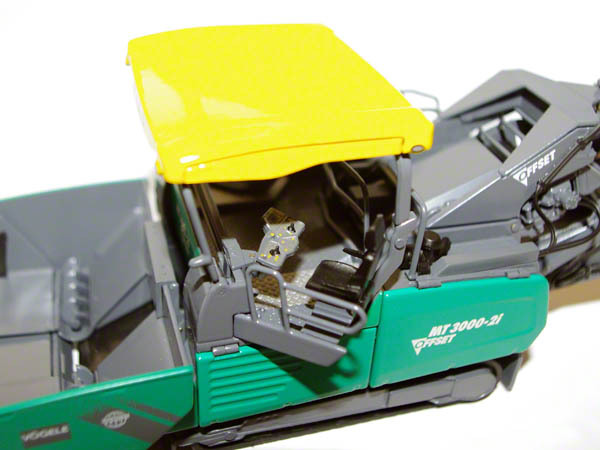 The relatively heavy model features lots of details. 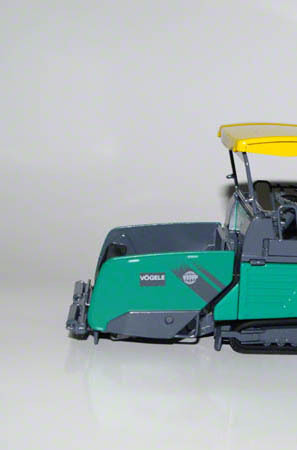 Just like the Vögele pavers, the MT3000-2i Offset has the ability to swing out both the right and left operator seat. The control panel can be moved along a rail from the left to the right position. New is the possibilty to rotate this control panel so that it's always parallel to the operator's seat. The colourful printed control panel has a realistic appearance. Also the roof can be extended at both sides, working lights are printed on all sides of the roof. 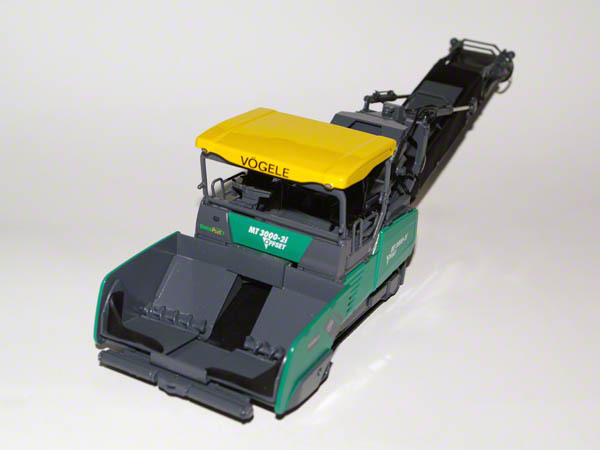 The two parts of the hopper can be extended or retracted for travel. The edge of the hopper is equipped with flexible rubber strips to avoid spillage. The push rollers on the front are separate parts, though there's very little movement in these parts. 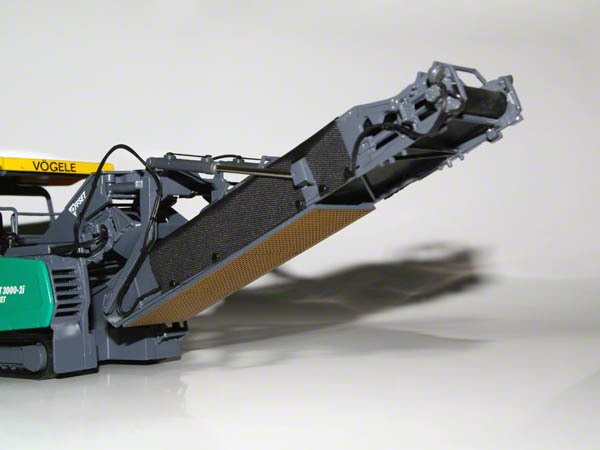 The bottom of the hopper can tilt backwards to feed the material towards the augers. In front of the crawlers are small blades which avoid spilled material to get under the tracks. The track frames are a bit plain compared to the rest of the model. This could have been masked by adding some warning labels. Just behind the hopper are small cylinders which can move the hopper up and down, complete with the feeding conveyor. 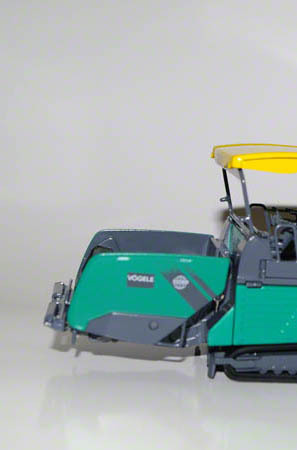 On both side of the model, two side panels can be opened to allow a view on the engine compartment. With the exception of one or two parts, the engine is shown as relief, but due to the printing in multiple colors it looks quite good. The conveyor belt is nicely detailed. The top and sides are covered with fabric, the underside has a photoetched cover. 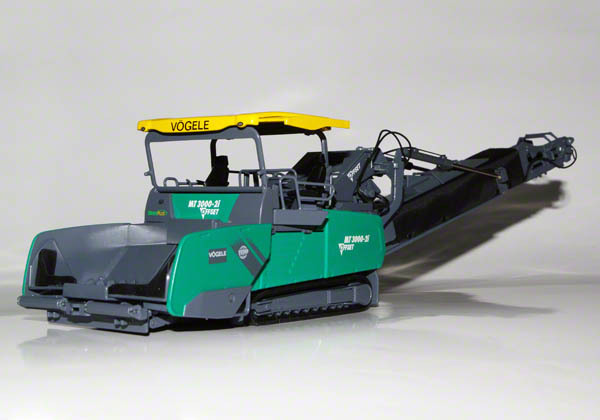 Hydraulic lines run from the machine to both hydraulic cilinders as well as the conveyor motors and two working lights are mounted at the top of the conveyor. 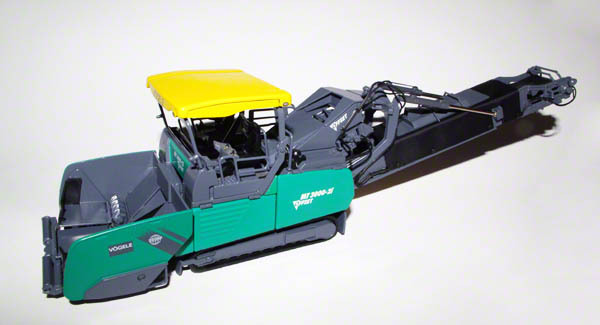 With the MT3000-2i Offset, NZG delivered a highly detailed model, which offers more functionality than expected. The paint is of the usual high quality and printing is crisp. The only thing missing are the warning labels as tgey are on the real machine. 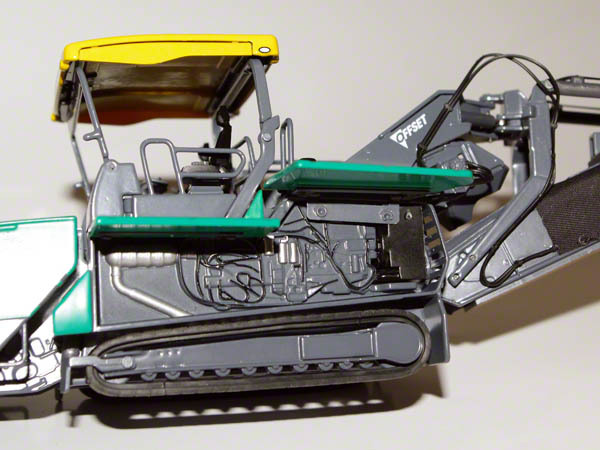 These could have given the crawler tracks the finishing touch. 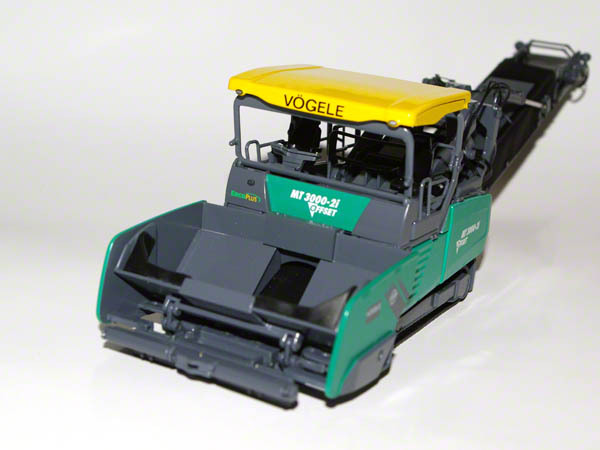 Nevertheless, this model is a real eyecatcher in the showcase are on the diorama of every roadbuilding ethusiast.